Malibu Screen Room | Wrisco Industries Inc.
A beautiful, custom fit Wrisco room enclosure will provide your family with a bright, cheerful and cool oasis for a full range of warm weather activities. Low cost, virtually maintenance free, illuminated directly from the sky, this unique indoor/outdoor living space is the perfect answer to today’s high energy and construction costs. Your family will find it ideal for entertaining, dining, playing, or just plain relaxing! Wrisco Patio Enclosures are the product of over 35 years continuous dedication to excellence in the design and manufacture of superior quality metal products. 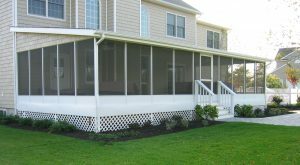 Our built-in quality is assurance that your investment in a Patio Enclosure will not only make your home more beautiful, but will provide you with extra living space, years of pleasurable, trouble-free enjoyment and energy savings as well! Outdoor living with indoor convenience. Enhance beauty and value of property. All maintenance free components designed to resist rust and rot. Rigid vertical main frame structure. Specially designed integral corner posts. Available in White, Bronze, Brown and Sand. 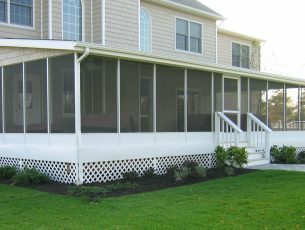 Custom fit to your patio or porch roof. Custom heights up to ten feet. Adaptable to any length and width. Optional Extruded door, pre hung 36" x 78" left or right. Includes door check, lock set and hardware. Individually packaged. Colors: White, Bronze, Brown and Sand. Standard 8' and 10' heights, custom sizes available. All extruded parts individually wrapped. 2" Square extruded main frame. 2" Square extruded corner frame. 1" x 2" Extruded kick plate mullion. 1" x 2" Extruded top and bottom mullion. 1" x 2" Extruded Wall mullion. 2" x ¾" Extruded top, bottom and wall expander. 12" - 18" - 24" Stucco embossed kick plate (Masked one side). 2" Extruded inside corner (Optional). Square serrated polyethylene screen spline. Easy to install regardless of pitch of roof or slab. Detailed, easy to read assembly and installation plans and instructions.